I have had the privilege and honour to work in the hospitals of Karachi during and after my studies. 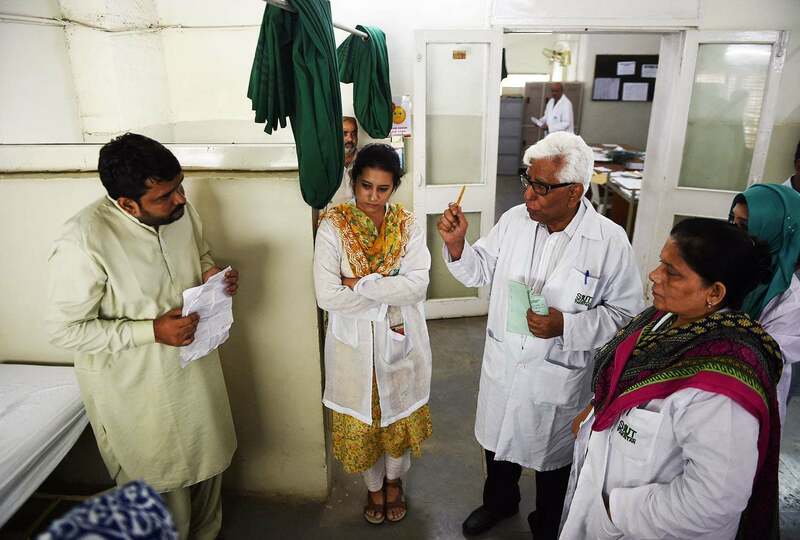 While I served my patients to the best of my ability, my experiences opened my eyes to much that’s wrong – and the little that’s right – about the state of healthcare in Pakistan. I learnt the importance of public hospitals, which even in the abysmal state they are in, continue to serve some of their intended purpose. Private hospitals, on the other hand, taught me about the inherent unfairness of privatised healthcare. But I also witnessed some great work being done by selfless individuals and groups, which gives me hope for the future. On the occasion of World Health Day, I would like to share what I witnessed. Public hospitals offer medical, surgical and emergency care to a huge number of people absolutely free of cost. What many people do not realise is that they also provide specialist care 24 hours a day. During the first month of my house job, and my second overnight call, I had just returned to the call room of my ENT ward when I heard a loud knock on my door at two in the morning. It was an elderly man and in his arms was his three-year old granddaughter. The gentleman was extremely worried and told me that the child had accidentally put something into her ear. I asked him to go to the small procedure room as I grabbed my instrument box and headed to examine the child. I sterilised my equipment and asked the gentleman and my ward assistant to hold the child as I proceeded to remove the foreign object from her ear. Two small rosary beads came out of the girl’s ear. After a week at my house job, cases like these became routine. But what surprised me was the grandfather’s reaction. The old man fell on his knees and broke down in tears. He told me how thankful he was and what a blessing it is to have public hospitals where there are ENT doctors at late hours of the night. He was absolutely right. In my experience of working at a private hospital’s emergency room, I was told that an ENT surgeon charges Rs25,000 to come to the emergency room from his home. This is just his personal fees. Add the charges of the emergency room (per hour), the procedure room (minor operation theatre), and other expenses, and you can expect a common man to go in debt. I had another case a few days later of a five-year old girl who had swallowed a coin. The availability of 24-hour radiography at our hospital helped me determine the location of the coin and, after consultation with a postgraduate trainee, we admitted the child to monitor her. The next morning, we located the coin – it was in the upper esophagus – and took her to the operating room where the consultant guided me in removing the coin. I still remember the father’s tearful eyes. He told me how he had struggled to find a rickshaw at night to bring his daughter from Steel Town, more than an hour from our emergency unit, because he could not afford an ambulance. These were just two very small cases. The emergency wards of public hospitals deal with far more severe cases and are a lifeline for those who don’t have anywhere else to go. Nonetheless, serious problems remain. From what I saw during my time in public hospitals, the quality of service was substandard. There was shortage of sterile equipment, lack of technique, and postoperative care was not at the level it should be. As a result, there is a high infection rate in patients who have surgeries in these hospitals, and mortality rates are higher as compared to private hospitals. Doctors sometimes did not trust departments of their own hospital. I remember a domestic worker who brought his eight-month old child with high fever and drowsiness from a village near Nagarparkar. He had to come to Karachi since there was no other hospital between Karachi and his village that offered infant care. Tests confirmed that the child had deadly meningitis. He was treated and survived. The IV antiviral therapy was free of cost. Although the treatment was free, the hospital’s staff asked the father to get laboratory diagnostic tests done at a different hospital, as they did not trust their own lab, especially for a critical case like this one. Public hospitals also don’t escape the routine ills that plague the rest of the government institutions. Considerable corruption and nepotism exists. 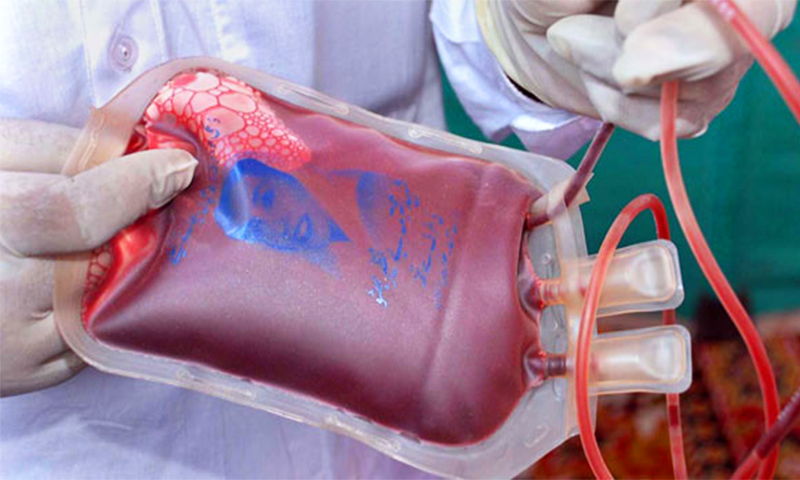 For example, at the diagnostic lab of one of Karachi’s biggest public hospitals, security guards demand money in return for test results, which otherwise would be absolutely free. Similarly, security guards posted at wards fleece visitors. The nursing staff abuse their power as well. Once I found a discrepancy in the medication that we had ordered for admitted patients, which got me in a bad patch with the nurses. I also witnessed a number of postgraduate trainees treating their relatives and acquaintances with drugs that were meant to be for the patients admitted to the hospital. During my ENT rotation, our toolbox containing equipment worth thousands of rupees was stolen from the office in the presence of office employees. The instruments were donated by several pharmaceutical companies as well as doctors for the care of poor patients. We could never recover the lost items. It was very common to receive phone calls from the office of the Deputy Medical Superintendent (DMS), ordering the house officer to go see a casualty immediately in the emergency room. These were patients who had made phone calls to the higher-ups – often the Interior or the Health Ministry – to get priority visitation from doctors. These phone calls from our DMS office were rude and offensive. When seeing these patients in the emergency room, there was always potential for verbal and physical abuse towards the doctor. Lack of security is a big issue at public hospitals. There are countless cases where the staff is verbally, physically, and even sexually, harassed and abused. We had a similar episode in the surgical ward of a hospital where I was working when workers of a political party attacked our team, blaming us for the death of their party worker who was admitted with gunshot wounds. The incident resulted in a horrific assault on one of the senior members of the surgical unit. The young doctors demonstrated, called for the boycott of Out-Patient Departments and even went on strike, but were only given temporary security guarantees. Within months, such incidents became common again. Despite the overall dismal situation, some improvements have been made in certain areas during the last few years. The Civil Hospital Karachi has received much needed assistance in form of gifts by the alumni of Dow Medical College on the respective silver jubilees of their graduation. Some of these outstanding contributions include the Dow OT Complex (batch of 1978) and the CHK Central Lab (batch of 1983). Another inspiring unit at the hospital is the Children’s Emergency Triage Unit (Batch of 1989 II), which is supported by the ChildLife Foundation. When I was a student at Dow, this building used to be a dark, dilapidated structure that housed the pediatric emergency unit as well as the Thalassemia transfusion unit. 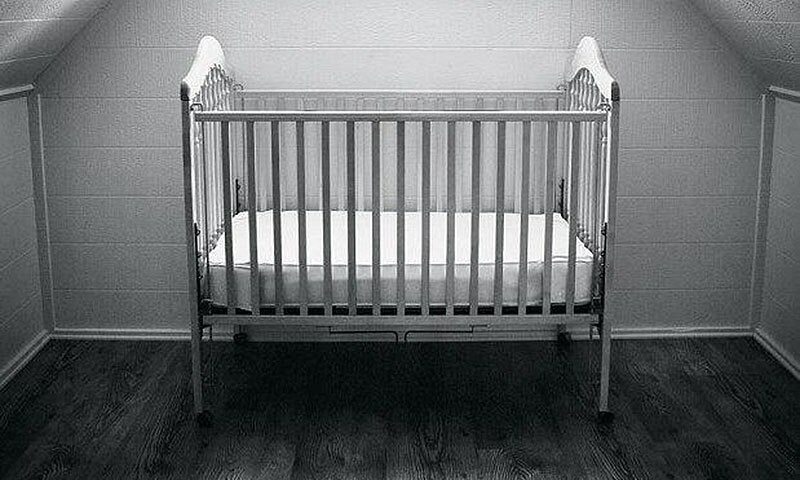 Today, the new unit claims to have raised the survival expectancy from 15% to 70% for the children who are treated here. 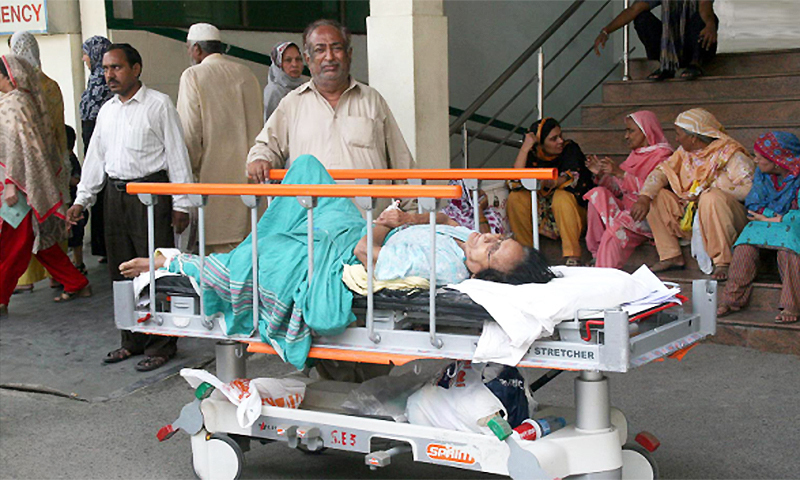 Public-private partnerships have also emerged in recent years at several wards in large public hospitals of Karachi. These partnerships help provide the necessary funds to run the wards and also help eliminate political influence in hiring of staff, for example. The improved administration, sanitation, discipline and postoperative care should go a long way in improving the quality of healthcare at these hospitals. The Shaheed Mohtarma Benazir Bhutto Trauma Center at the Civil Hospital has eased the burden on several specialty units of the hospital. The Center, if run with dedication, should usher an era of improved mortality and morbidity for victims brought to the Civil Hospital. My experience at one of the most elite hospitals of Karachi taught me a lot about the cruelty of class differences and healthcare based on affordability. The emergency rooms at this private hospital were available only for those who had the money. The staff was trained to recognise which patient could pay, while those whom they felt would not be able to clear their dues were bluntly asked if they could actually afford treatment at the hospital. If someone was unable to pay, they were told to leave. If any care was somehow given to those with less money, they were required to deposit their CNIC, which was only returned after they had paid the bills. It is extremely unethical and immoral to ask a patient if they can afford treatment, especially at the emergency, when they are in their most vulnerable state. The hospital did not have any charitable funds set aside for this purpose and doctors were often pressurised to get the patient moving so that the bed could be emptied for those who could pay. At the emergency room, we once received a patient who had a bleeding toe wound that required suturing. As he was being turned away at the reception, a lady, who was visiting a patient, noticed what was happening and got extremely upset. She instantly paid for the man’s treatment and left another Rs1,000 to help any other patient who could not afford treatment. The receptionist promptly returned the money, saying that there was no such fund at the hospital. On a different occasion, I received a trauma victim, a teenage girl, who had fallen off a motorcycle and had a severe head injury. She was brought in by another citizen who had witnessed the accident. I rushed her to the minor operating theatre and performed the ABCD’s of trauma care, but the staff kept pressurising me to have her shifted to the Jinnah Postgraduate Medical Centre (JPMC). She needed a CT scan, for which I was willing to pay from my salary. But then what? The staff asked me if the victim could afford to call a neurosurgeon. The girl was accompanied by another teenager, who introduced himself as her brother. He was barely 13-years-old and could not make the decision to take her to another hospital. It took two hours to reach the victim’s father, who took her to a different hospital after he finally arrived. This incident taught me that although private hospitals boast about their 24-hour emergency care, their services are never free. I witnessed similar situations at another private hospital, which also happens to be one of Karachi’s most well-known and respected establishments. A young man was referred to us from the Civil Hospital and JPMC as they did not have a bed with a ventilator available. The patient, who was riding his motorcycle on his way to appear for his exams, was hit by a speeding car. He had severe head injuries as well as multiple bone fractures. His helpless father, who hailed from a village outside Karachi, in a state of despair, admitted his son to the ICU of our hospital. During the admission, his patient’s leg was infected from a common, yet deadly, infection from the ICU and required amputation. After 11 days in the hospital, the young man passed away, leaving his father in debt worth Rs1.7 million. The hospital would not release the son’s body until his father had paid the dues. He paid some of the amount by selling his small plot of land where he lived. Since it wasn’t enough, he borrowed from his family and friends. He then had to sell his last possession – a camel – to pay the remaining Rs75,000. He lost a place to live, his livestock, and above all, his son. While discussing healthcare, it would be unfair to not recognise the incredibly humanistic endeavours of physicians like Dr Adib Rizvi, who have proved to the world that quality healthcare can be provided for free. 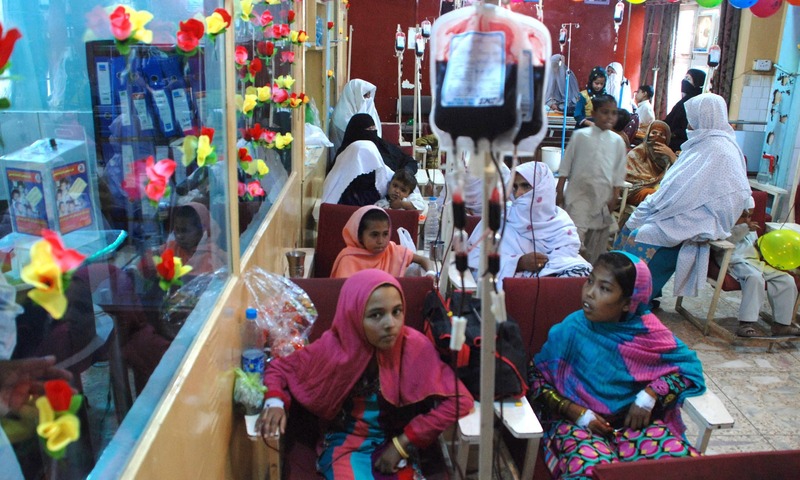 At the Sindh Institute of Urology and Transplantation (SIUT), there are no VIP patients. Nobody takes bribes or shower favours. Each patient is seen on a first-come-first-serve basis. From admission to transplantation and immunotherapy, everything is free of cost. The Indus Hospital is another example. Being the first paperless hospital in Pakistan, the project is the vision of Dr Abdul Bari Khan, who was also involved in the formation of Patients’ Welfare Organisation in Civil Hospital Karachi. These inspiring individuals and many other hospitals, donors, philanthropists and social workers are an indispensable resource of benefit to our healthcare system. Without them, whatever little support the poor and the underprivileged have, will not exist. A good review of the health care scene. Many people outside of health care can get a view of how things apply to the common man. Government hospitals with many patients and limited funds have provided professional help to so many , and often better advice than private hospitals as no monetary benefits are involved.Non professionals see the private rooms, bright lights and shiny corridors which impress them, but know nothing about professional standards. A good but a sad read. Bad state our society is in, the private hospitals that get inexpensive amenity plots from the government do not care for the society. The only hope are people like Dr. Adibul H. Rizvi. I recall meeting him once he said let alone the treatment but the transport cost of patient may also be financed at SIUT if there is a deserving patient who cannot afford. May Allah bless him and may we have more people like him who follow the similar ideology. Ironically public hospitals are the most advanced hospitals available to people living in small cities in terms of both facilities and specialist availability. 24 hour emergency service is only provided by government hospitals and you appreciate its value more when you have to brought your relative in hypovolemic shock, from a private clinic to government hospital,because the former have no protocol for treating such kinds of patient and paramedics and kept on loooking for doctors command even for passing IV line. Excellent write-up, Jahanzeb. Keep doing the good work. The country should be proud of you. May you have a long, healthy and fulfilling life. No question if you can get to a hospital in Pakistan, the rest is free. No where in the world does this happen. In America they would first want to have proof of your financial status. A minor emergency can wipe you out. A major one, you lose your home. Else they have dropped critically ill and seriously injured patients on the street once insurance runs out. Old people have death panels set to covertly plan their end. BTW Medicine is the "Leading Cause of Death in America". @Paggri sambhal : He may have to further his education. He may come back and serve the country. Excellent article, it will be good to highlight the main cause of poverty, population growth vs. resources. Yes it seems this doctor has left Pakistan but read the article about how the past graduates of Dow Medical Graduates donate equipment and money to the healthcare system of Karachi. Some of these doctors are now overseas but they have not forgotten Karachi. 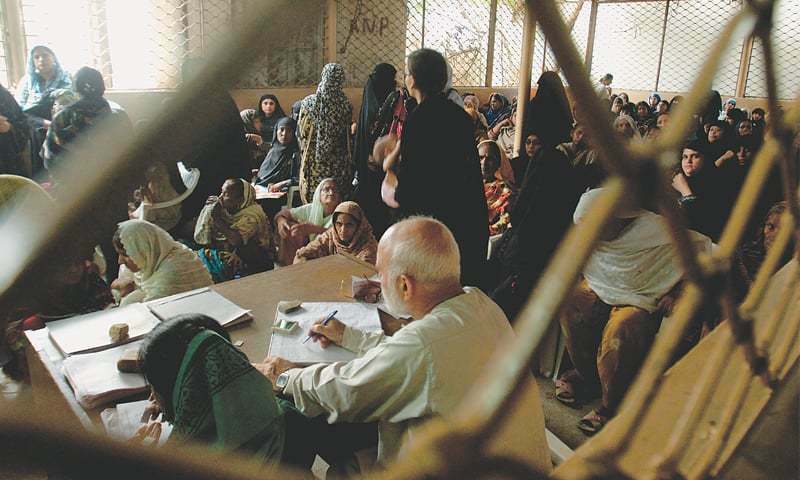 They send money from their hard earned salaries from the west and this has proved vital in helping improve health services in Karachi. I live in USA. Our current government is trying to get to health care similar to described here. They believe poor do not deserve healthcare. You buy what you can afford. Tragic. Pakistan would be a great country if all Pakistani doctors living and practicing abroad would return to their country of birth and help their own citizens. Those who have looted billions of the country must read this article, if they know how to read. 10% of the looted money will take care of every poor citizens of the country. I am a fool . I am hitting my head on the wall. @Mohammad Ali bajwa "Pakistan would be a great country if all Pakistani doctors living and practicing abroad would return to their country of birth and help their own citizens." Sure it would be a great country...if we provide protection to our professionals and innocent citizens from being killed by terrorists. Countless doctors got killed by terrorists like sitting ducks and nothing was done. Our decision makers especially in last 40 years have mortgage the society for some very meaningless and vested interest of their own. I would like to add some points since I'm a senior to the author in ENT Hospital with similar working environment . Almoat all doctors who have once worked in such hospital would want to work here including the author. He may settle down in US and donate million dollars but will never work here.1, Govt hospitals are run like Personal Jagirdari of politicians and head of Dept. 2, there is no real appreciation of selfless work you do.The same people who fall on their knees in gratitude will slap and kill you next time if any pt dies.There is no security an no real respect for doctors these days.3, it's not financially viable to support your families. A qualified doctor starts earning at 32-33 years of age and he is paid a pittance. A photographer or Small shop owner earns more money than a govt or even a normal private doctor. Afterall, doctors have families too. I want to ask the author... 1. Would you work yourself in Pakistani Govt Hospital?? 2. Would you make your son a doctor? Bravo for writing such an incredible article! Great job and please continue highlighting the true state of our healthcare system. Everything in Pak is a mess but people can't see it because they are so use to it. People only realize it when they reach the West. Everyone is busy hording the money whenever they can because that is the system. If everything is messed up at the top how do you expect good at the bottom. 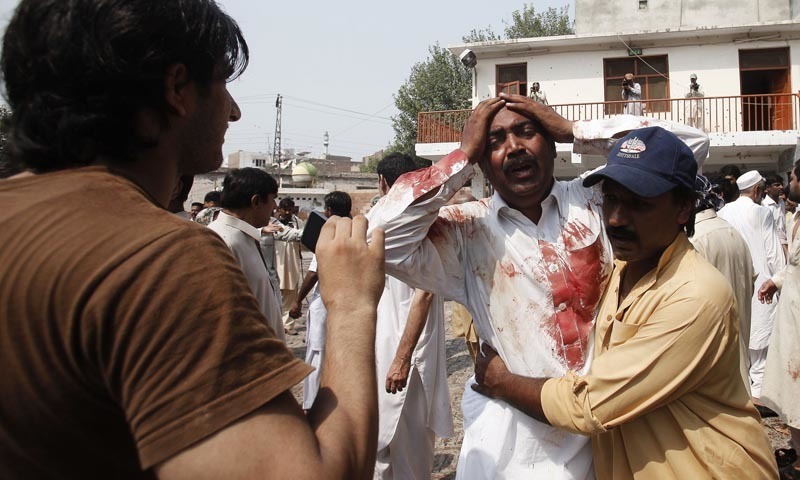 The state of Pak affairs will only improve if Pak elect leaders who feel the peoples pain. Most of the Pak leadership comes from rich class who has never experienced public services first hand, so how can they feel the general public's pain and sadly if Pak do elect someone from the middle or poor class they quickly join the corruption at the top. The leaders who hold the country's interest supreme instead of their personal interest are the one who will feel the peoples pain otherwise round and round we go. @kaiser: As author mentioned, "From what I saw during my time in public hospitals, the quality of service was substandard. There was shortage of sterile equipment, lack of technique, and postoperative care was not at the level it should be. As a result, there is a high infection rate in patients who have surgeries in these hospitals, and mortality rates are higher as compared to private hospitals." @Paggri sambhal : all you found in this article that the author is currently US based. He is sharing what he has experienced. He is not talking about the ordeal of Doctors. @Mohammad Ali bajwa : while your were writing your comments, a Doctor in Lahore shot-dead by unknown assailants. Our government should play a bigger roll in caring for the poor and needy. The clergy needs to emphasize service to humanity. Volunteering is non existing in Pakistan compared to western countries. Media also needs to highlight this. Nice article. “We cannot let them (patients) die, just because they cannot afford to live.”...according to Adeeb Rizvi. This could have been an ideal caption. More hope than despair here...and hope springs eternal. Pakistan is the only few countries in the world where you can have cancer treatment for free...through charity run hospitals. Private hospitals can sometimes become downright nasty when it comes to fulfilling their payments. Sadly, the staff that gets blamed and sometimes yelled at, has no power to help. The common man usually doesnt understand that it's the owners/board/whoever that runs healthcare like a business, and are the real monsters. I commend those who do lot with little hospital infrastructure available. There is dire need to study and highlight preventable methods and reduce number of diseases at the first place. Top of item to look at will be clean water supply and sanitation. Politicians love to tell people who many hospitals they are building although they are hardly functional to minimum acceptable standards. Sadly very little or attention is paid to basic infrastructure. You can fill up hospitals with patients but it will not help if your don't address basic reasons people getting sick. Look at western world and you will note they developed their infrastructure only than for an example we're able to reduce water born diseases. I hope it make sense. Very well written, boy. Keep up the good work. salute this doc. for his sincerity and duty consceinceness which is rare among govt. docs. in developing countries. having said this i would. like to share here the insurance scheme of state of TAMILNADU, where govt. pays fr health insurance premium of poor people to companies and they are treated in excelent private hospitals up to rs. 2 lakhs. per year in generaal for treatment including surgeries and also beyond the limit in certain cases as exceptions!/this has helped people to get even heart procedures like angio plasty!done under the scheme. similarly govt. hospitals have been upgraded with good infrastructure, and they are allowed to charge reasonable charges for patients for treatment and services depending on the capabilty of individuals! this also has helped govt. hospitals to generate money for thier running and maintenanne expenditure and made use of by large no. of patients especialy in cities \big towns. that's just great.study at people's tax payer's money then get the hell out of here and then talk about health reforms and poor health sector.this is our country! !we have to make it a better,how will it improve then if doctor run out of here and then talk about poor health services. Good insight of meducal facility...propably this the reason without risking their health , Nawaz Sharif, Zardari and other political & elites travel abroad for various medical reasons varying from checkup to treatment..
@El Cid seems like you have never heard of Britain ,on National health service the whole population is treated free ,absolutely free ..
Nice article BUT a few points.You do not need to sterilize instruments used for external ear issues.Now that you are working in America>You will NEVER go back to the poor country. @SALMAN Majority never return. Their intention is not to do so.And where will he work as a trauma surgeon besides Aga Khan University Hospital in Karachi? Sad to know the good doctor has left Pakistan. No blaming him,of course, may he have the best of success, but hoping that the day comes when our talent can stay in their country. Why do most doctors after getting medical education and training in Pakistan for almost free at govt. expense come to the West and then do nothing for the people of their "domicile region?" Corrupt leaders have done nothing for providing basic healthcare for masses all over the country! @Kaz Serving humanity is more important than earning money! How come aga khan hospital don't treat the poor for free. They claim that they are very charitable. I don't see the regular masses being treated in aga khan hospital. Aga khan hospital is for the rich and elite who can afford to pay the piper. Pathetic that while the citizens suffer and risk their lives daily in substandard Pakistani hospitals; those who claim to serve the citizens and are paid their salaries and benefits from the public exchequer (political leaders and bureaucrats) routinely go abroad for treatment at the expense of the public in clear violation of the public trust but unfortunately there is no one there for accountability. @Sara Soo true...the corporate culture hospitals do not treat the poor...its a pure business with no concern for humanity! The article shows and proves that it comes from a truly sincere, God fearing and people loving heart. May God bless this amiable doctor. All the private hospitals past history should be checked and Such private hospital owners and top decision making executives whose greed may have caused death, imputation or handicap of any patient or patients should be tried under manslaughter or terrorists laws with capital punishments. Same should be done for the proved deliberated negligents of Govt hospitals causing death to the helpless patients. But who will impart the Justice and who cares for the lives and well beings of poor and middle class dragging the burden of life with hard earned meager income? Not the Alibaba and chalis chors nor the king of the corruption and the cronies? Nicely written but a said state of affair. More or less its the same story in Indian public hospitals as well. Honest docs like you and willing political leadership is the only hope to clean the system and provide cheap/ free of cost health care to the needy. We have a similar situation in India but little gets reported or discussed in the media. Any improvement can only come about when it is recognized as such. The collusion of those in power and the private health sector is the additional layer peculiar to India. Jahenzeb you expose the good and bad of our health care system very well. BTW the private hospital that are trained to harass people to keep away from the hospitals are not only limited to people with no money; the most scary part is that they also do it with people who has money but are not profitable enough to occupy the bed in the hospital.